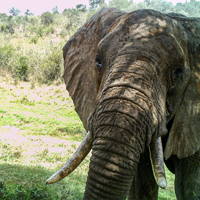 Improving coexistence between people and wildlife in Laikipia County, Kenya - Lolldaiga Hills Ltd. Some of us are fortunate to live life one step removed from the tumult and chaos that plays out daily in surrounding communities. It’s often a harsh struggle for existence for humans and animals alike, which is why notions of wildlife conservation and environmental protection do not top anyone’s agenda. Wildlife conservation in Laikipia County, central Kenya, is often linked to reducing human-wildlife conflict. While conflict with predators and elephants is well known amongst Laikipians, there is little awareness about lesser known sources of conflict. Dogs represent the biggest source of daily conflict, while birds (guineafowl, cranes, quelea, etc.) are a growing problem as human populations continue to expand. At the same time, most of us know the current shameful state of environmental protection in Kenya, from decimated forests to stinking rivers and the inherent loss of biodiversity. 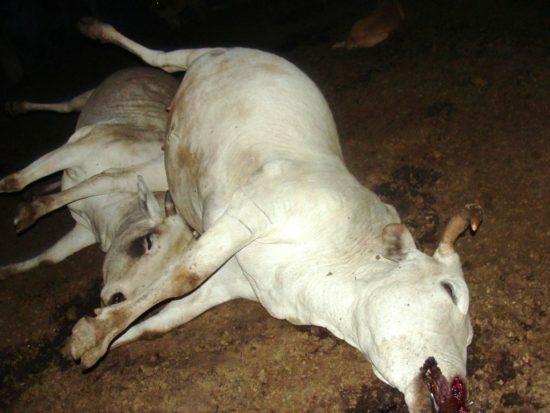 Cows after eating contaminated grass at a poisoning site, ADC Mutara Ranch, Laikipia County. Photograph by Joseph Wahome. One common thread linking conflict, communities, and environmental degradation is the widespread abuse of pesticides, some of it unintentional, some not. What is nearly universal is the almost complete lack of understanding about the dangers of using highly toxic and readily available pesticides to poison wildlife, as well as to produce those perfect red tomatoes occupying your kitchen. 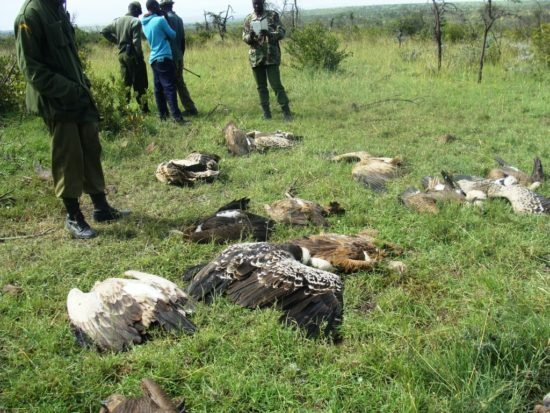 One of the ways in which The Peregrine Fund is tackling wildlife poisoning in Laikipia is through creating awareness about the hazards posed to humans and livestock by rampant pesticide abuse. For example, it does not benefit your farm if you poison the feral dogs that are eating your maize and then your chickens consume the poisoned dog vomit and also succumb. Spraying Round-up around the perimeter of your shamba (= garden) to poison the livestock that prefers eating tomatoes to dried grass nubs doesn’t win you a Good Neighbor Award. Adult Rüppell’s Vulture Gyps rueppellii. Photograph by Darcy Ogada. Over the past 1.5 years, The Peregrine Fund has conducted community-level training in Laikipia aimed at reducing wildlife poisoning and the conflict that triggers it. 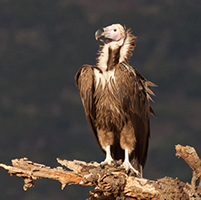 Our main interest is in reducing the unintentional poisoning of vultures. 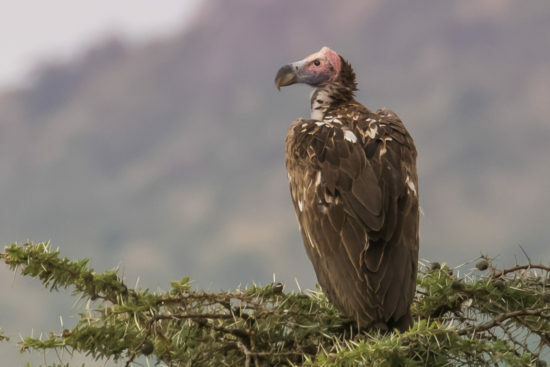 Poison has decimated their continental populations and has resulted in the recent up-listing of six species of vulture to ‘Endangered’ or ‘Critically Endangered’. While our initial training focused on creating awareness about the toxicity of pesticides, their environmental hazards, and how to safely respond to a poisoning incident, in June 2018 The Peregrine Fund began additional training in partnership with Living with Lions. This is aimed at teaching people how to construct low-cost predator-proof bomas (= corrals). Community response to both training exercises has been amazing and overwhelming. Poisoned White-backed Vultures Gyps africanus and Rüppell’s Vultures Gyps rueppellii, ADC Mutara Ranch, Laikipia County. Photograph by Joseph Wahome. Collectively, our team has trained nearly 1,000 people representing 54 community and self-help groups, Government Service Unit officers, Kenya Forest Service rangers, bird club members, community health workers, and employees of the Laikipia County Government based in Rumuruti. We have focused initial efforts around Rumuruti due to high levels of conflict and poison use, and have started working with communities around Solio, another hotspot of wildlife conflict and poisoning. Laikipia County’s Community Development Assistant (CDA) recently confirmed that our trainees successfully averted the poisoning of a lion pride at Lorien. 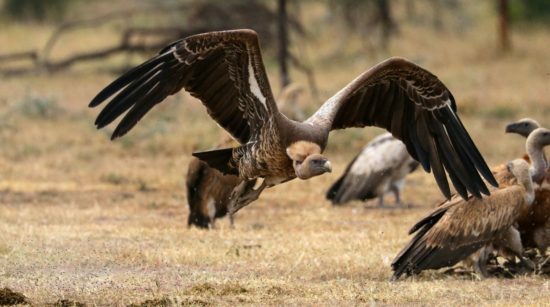 This would not only have resulted in the deaths of the lions but also, probably, of tens of vultures and other scavengers. She reported that the trainees took the lead to hold-off the angry people to avert the poisoning of the lions (which were later translocated). She also mentioned that she recently met with a trainee from Bobong’ Community who was walking hastily and carrying one of our Poison Response Kits. Out of curiosity she stopped the man to find out where he was going. It turned out that he was on a one-man crusade, given the urgency of the issue, to educate a fellow local who had vowed to lace a lamb carcass with poison to kill a dog that was eating his chickens. His crusade was successful. Our bird club trainees report a decrease in poisoning of ‘Endangered’ Grey Crowned Cranes. A number of trainees have conducted poisoning awareness barazas (= meetings) within their communities. Predator-proof boma construction is on the rise around Rumuruti. After the current dry season we will begin evaluating their progress. In October 2018, The Peregrine Fund began collaborating with the NGO Lion Landscapes to train their Lion Rangers and people in more communities throughout Laikipia. 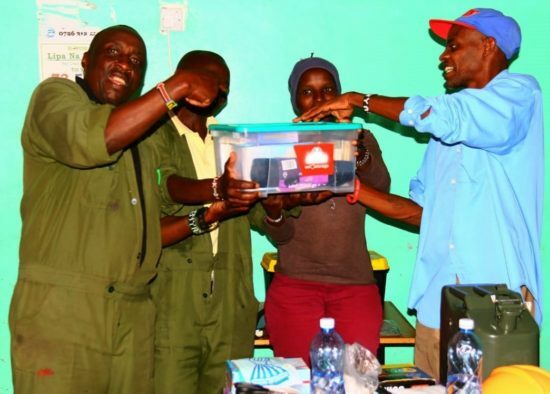 Employees of the Laikipia County Department of Environment receiving one of The Peregrine Fund’s Poison Response Kits from Martin Kahindi. Photograph by Martin Odino. Lappet-Faced Vulture Torgos t. tracheliotos. Photograph by Heather Wall.